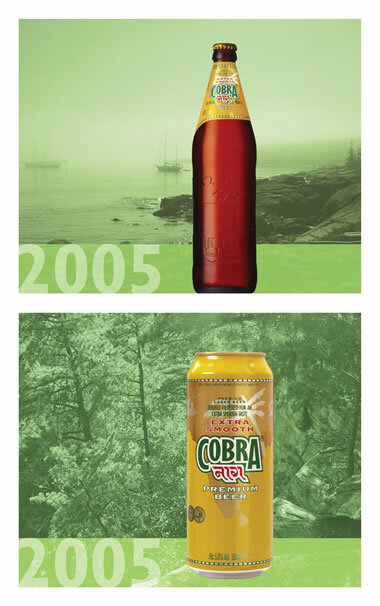 Originally when Cobra beer first started being produced in 1989 it was brewed in Bangalore, now production has moved to sunny Fulham. Originally the beer was to be called panther but the name was changed after tests suggested panther was not a popular name. I have seen cobra available in lots of supermarkets but where I encounter it most often is in the curry house. The beers major selling point is as a less gassy alternative to other lagers, it is said to go perfectly with a curry. Now, I adore spicy food but I do have a tendency to hiccup quite loudly whilst tucking into my phaal, therefore Cobra (you would think) seemed like a perfect choice. First thing to notice about this beer is that it’s most commonly sold in large bottles, 660ml instead of 330ml, this is a good start you see because when the missus asks you how much you’ve had to drink tonight you can honestly reply….’why, a mere 8 bottles my dear’ and actually mean it. Another point worth noting is that the bottle itself is aesthetically alluring, the brown of the glass and the yellow label are pleasing on the eye, also the bottle is covered with various Indian inspired motifs such as elephants and exotic plant life. While I’ve never met a soul who chooses their beer by the way the bottle looks, it’s good to know these things so you can keep your eye out for it. But I have to say I don’t rank Cobra as a high favourite. The lower gas content is well suited for curries and I did notice a reduction in the volume and frequency of my embarrassing hiccups, and yet there just isn’t enough flavour there to warrant ordering another. I’d take the extra hiccups for a more delicious beer. It’s alcoholic content is 5% so middle to high in strength. The lack of gas would make this a good choice for people who feel too bloated drinking regular lager all night. Also a good choice for the last few drinks of the evening (especially after a filling curry). As I say, a beer has to go pretty out of it’s way to be bad and Cobra is certainly not ‘bad’, it just lacks the depth of flavour and full bodied robust qualities of some other lagers out there. It’s low gas will appeal to some and Cobra definately fills a niche, it’s just not got quite enough to become a regular drink of mine.